One of the biggest problems to be cured in relation to who needs to use a bionic member is precisely the lack of sensitivity. The latest addition is that biomedical engineers have created a new generation of electronic skin that is able to restore a true touch sensor in patients who have lost limbs and use prostheses. “After many years, I felt my hand, as if an empty shell had been filled with life again,” said the anonymous testator who served as a team volunteer at Johns Hopkins University. The artificial skin is made of fabric and rubber, incorporated with sensors to mimic the nerve endings. The e-dermis recreates not only the sensation of touch, but still sensory stimuli, such as pain, and retransmits the impulses back to the peripheral nerves. The electronic skin allows the user to feel a continuous spectrum of tactile perceptions, including light touch and even harmful or painful stimuli. 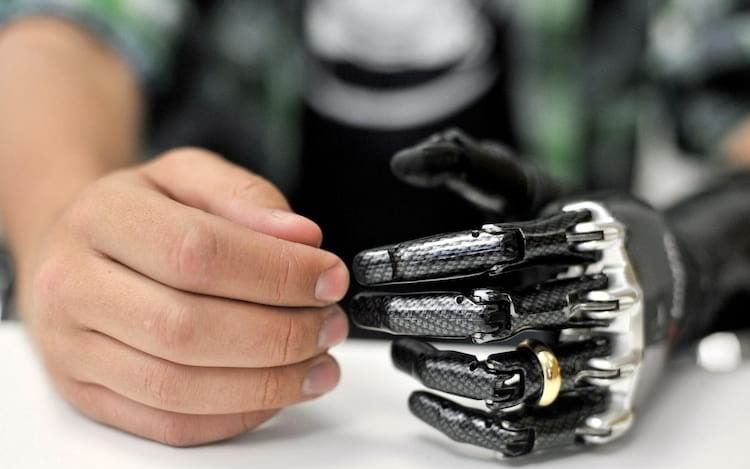 “This is interesting and new because now we can get a prosthetic hand that is already on sale in the market and endow it with an e-dermis that can tell the user if he or she is picking up something that is round or has sharp edges , “said researcher Luke Osborn. E-dermis allows sensation of touch and pain in bionic hand. The team developed a “neuromorphic model” that is capable of mimicking the touch and pain receptors of the human nervous system. Thus, tracking the activity of the brain through electroencephalography, or EEG, the team was able to prove that the volunteer was even able to perceive the sensations in his bionic hand. The e-dermis connection to the volunteer occurred noninvasively, called transcutaneous nerve stimulation, or TENS. To have the sensation of pain, the volunteer touched a pointed object. The pain was not felt in round objects, for example. The e-dermis, however, is not yet sensitive to temperature. In the initial test, the team focused only on detecting the curvature of the object (for touch and shape perception) and sharpness (for pain perception).